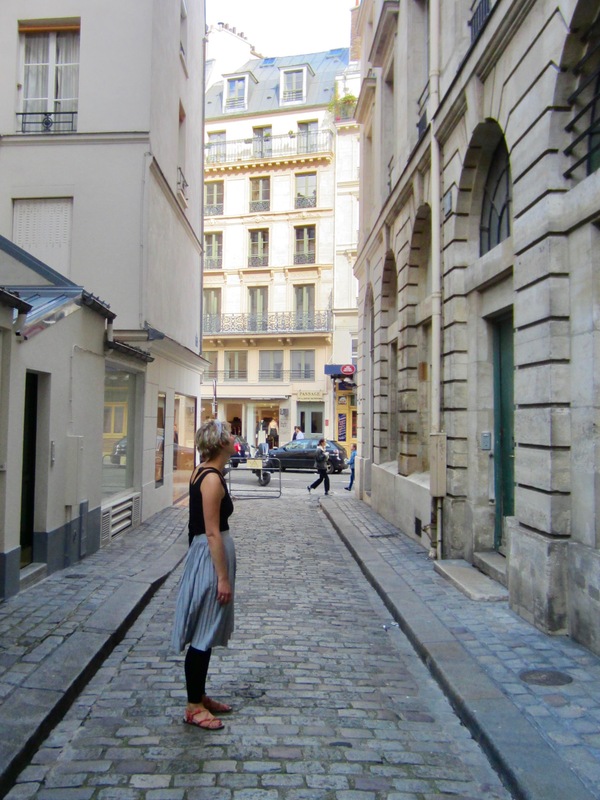 Well, it’s that time of year I bring you another Pinteresty-style post. And yes, it has to do with picture frames again. That’s what my DIY projects tend to be. 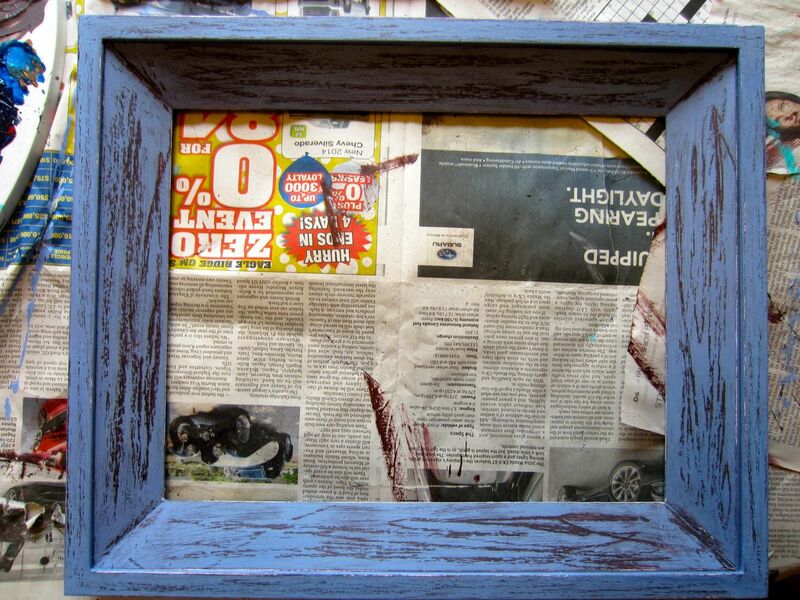 This time, I tackled distressing a picture frame. I wanted some art for my bathroom as I’m still decorating after over a year of moving into my apartment. So I did some antique shopping in Fort Langley and bought this old print and picture frame. 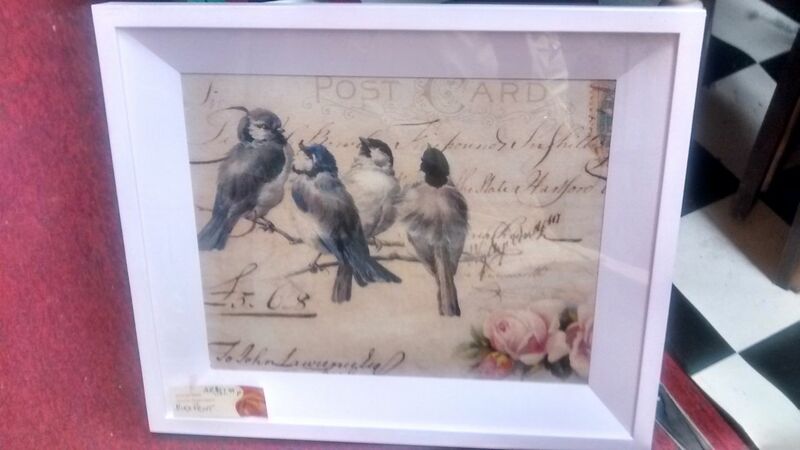 I liked the print, especially the postcard text behind the birds. It fits perfectly with the old handwriting on my shower curtain. But I didn’t like the sickly sweet pink of the wood frame. So I distressed it, thanks to these helpful “how-to” instructions I found here and here. 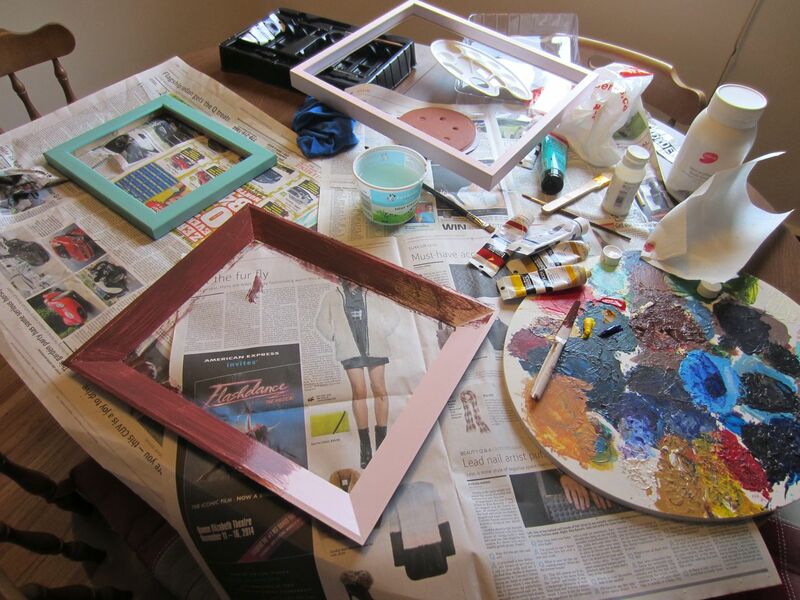 Since I wanted a dark brown colour to be the old layer of paint that showed through, I started off by repainting both pieces of the frame, applying two coats. 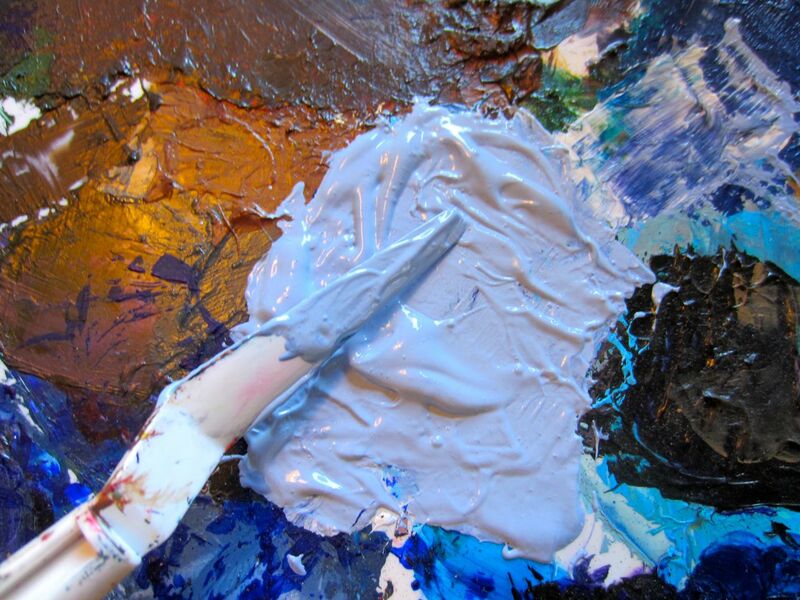 My old acrylic paint set I got for Christmas one year came in handy so that I didn’t have to buy all the supplies. My kitchen table work space. The turquoise frame to the left needed some touch-ups so I did that at the same time. 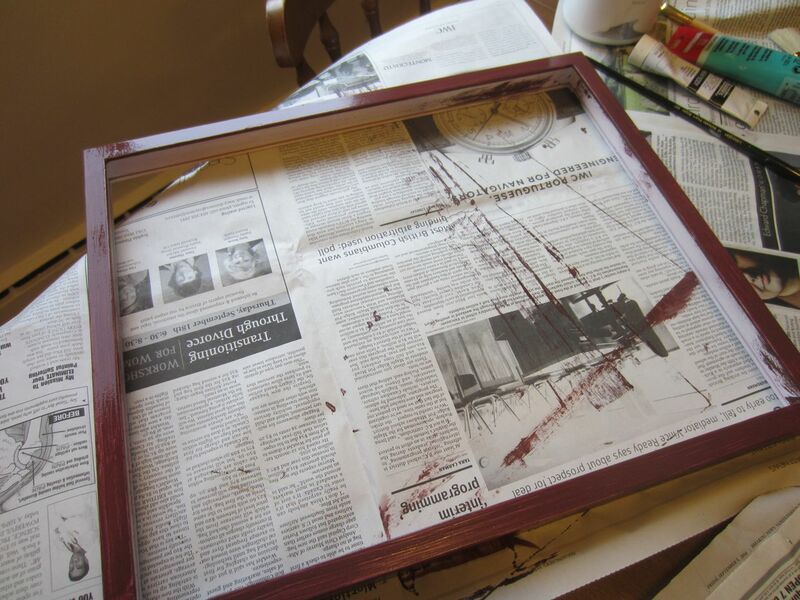 After letting the paint thoroughly dry, I rubbed the edge of a candle along the frames because this prevents the next colour of paint from sticking to the brown. 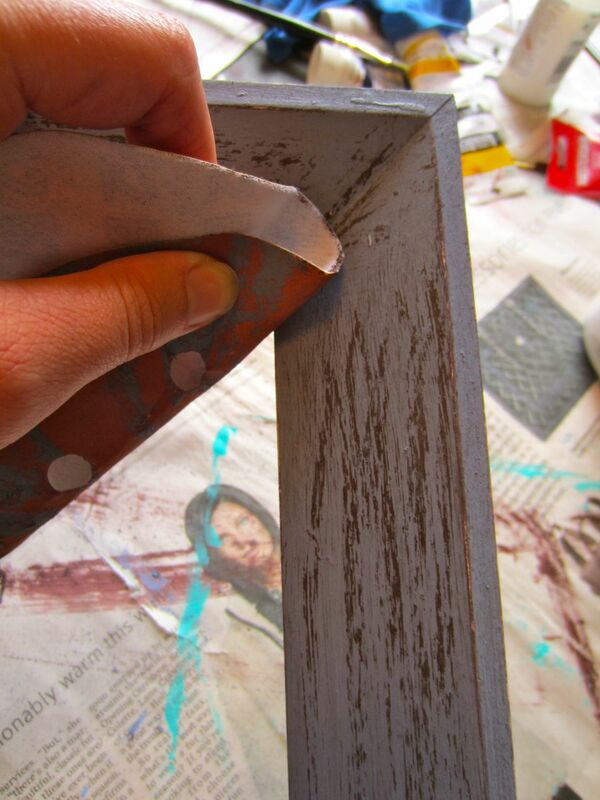 It also indicates which parts of the frame will peel away when you bring out the sandpaper. Don’t be shy with the wax. 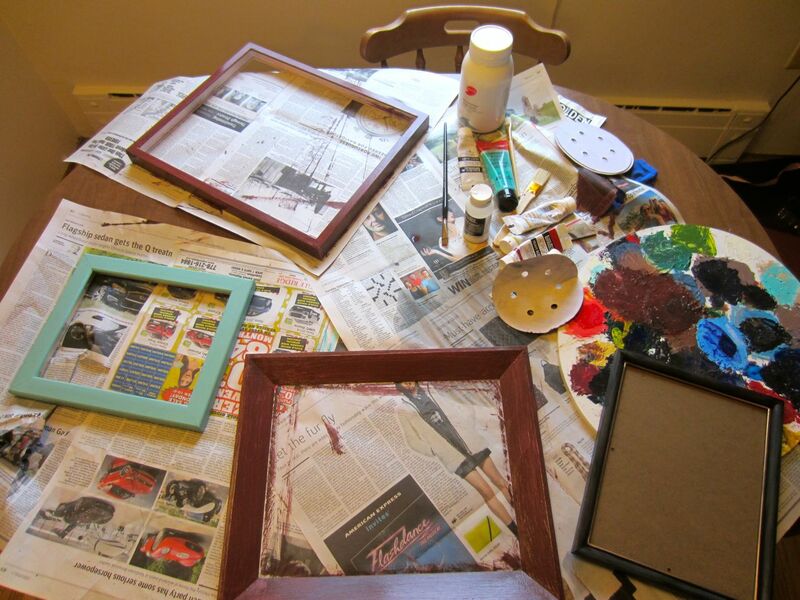 If you want a really distressed frame, rub away. You can see the path of my wax below. I painted the two pieces again in the main colour I wanted the frame to be. I only did one coat of the purply grey because I was going to be sanding some of it off anyway to have the brown show through. 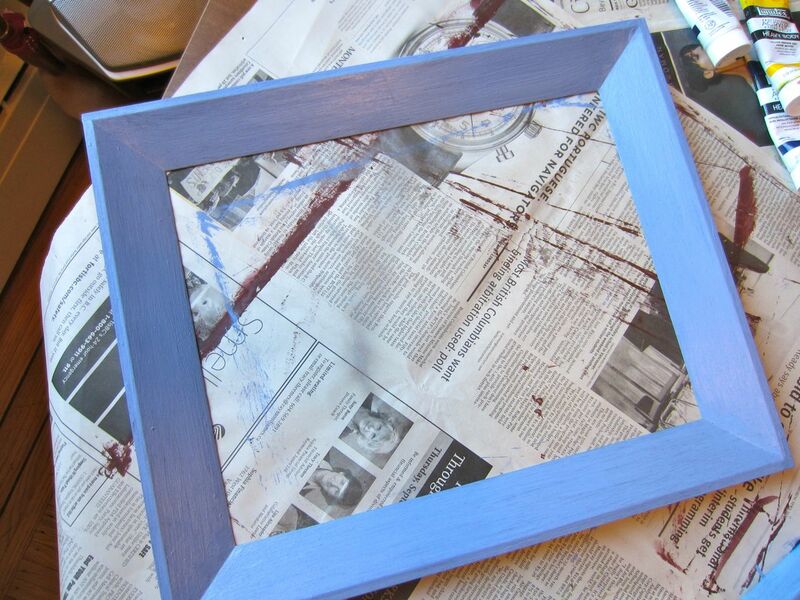 Next, I took a piece of sandpaper and started rubbing the frames. I was surprised how easily it took off the paint in the places where I had rubbed the wax! 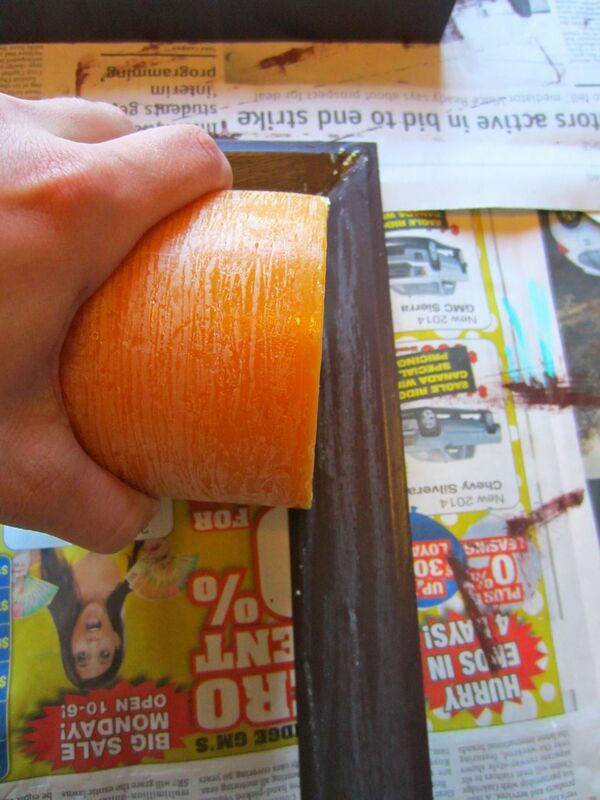 The last step was to apply some clear varnish to seal in the paint. 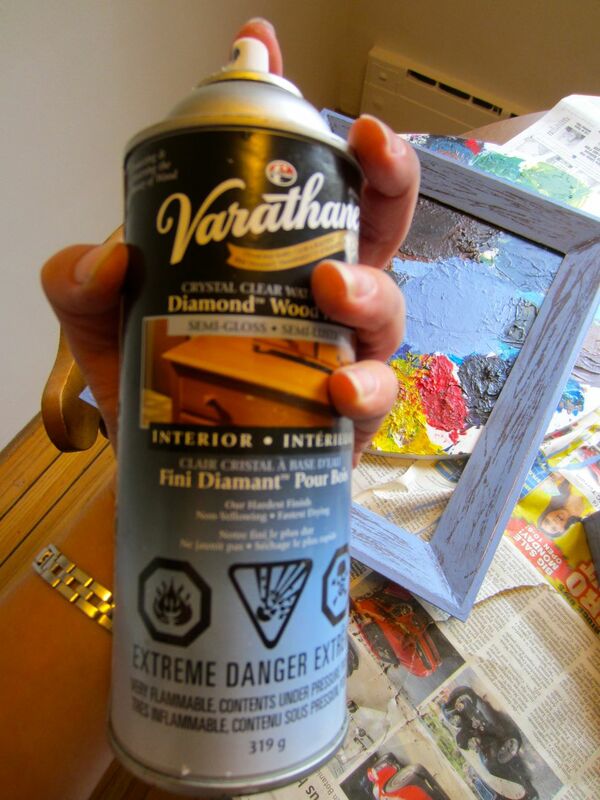 I borrowed a spray can of my dad’s which gave it a semi-gloss look. And voilà! The funny thing is now I don’t even think I’ll hang it in my bathroom. I like it more for my hallway or living room. 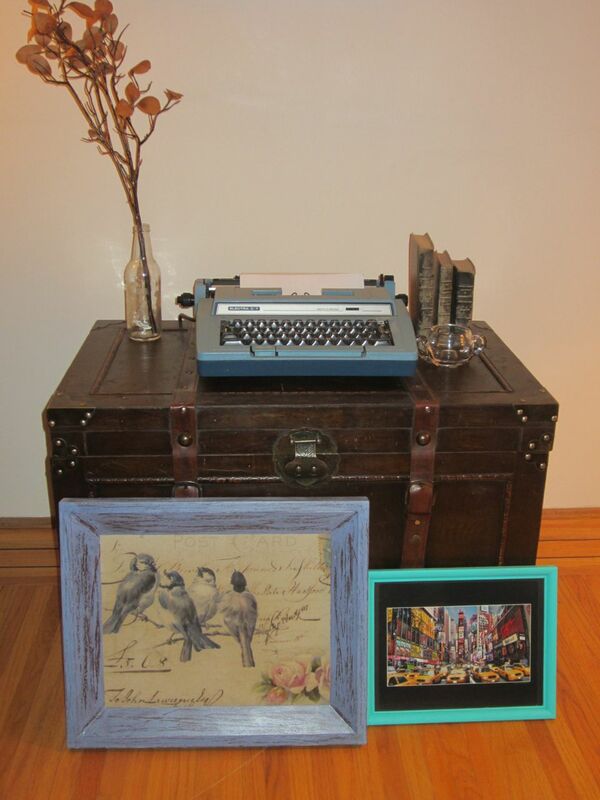 My antique corner, minus the Times Square frame I also repainted. You could say I have eclectic tastes! So that was my bout of craftiness until next year. Any Distress-It-Yourself (or Do-It-Yourself) projects you have on the go?